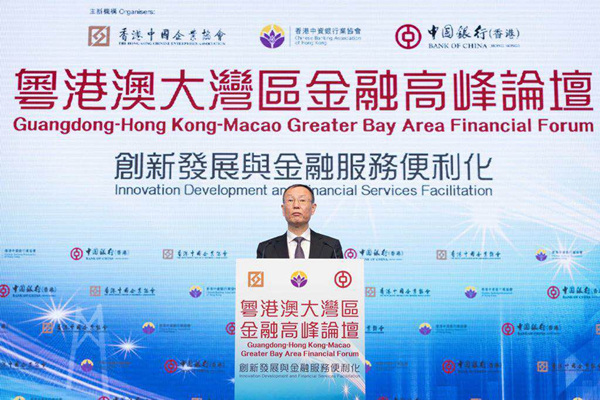 Wang Yiming, Vice-President of the Development Research Center of the State Council (DRC), led a delegation to attend the Guangdong-Hong Kong-Macau Greater Bay Area Financial Forum from August 28 to 31 in Hong Kong. Wang delivered a keynote speech on building a world-class bay area and deepening financial cooperation and innovation at the financial forum, hosted by the Hong Kong Chinese Enterprises Association, the Hong Kong Chinese Banking Association and the Bank of China (Hong Kong). About 800 professionals attended the forum to conduct dialogue on financial innovation and financial services facilitation. During his stay in Hong Kong, Wang visited the Hong Kong Monetary Authority, the Bank of China (Hong Kong), China Merchants Group, China Resources Group and the Hong Kong Chinese Securities Association to research the construction of both the Guangdong-Hong Kong-Macau Greater Bay Area and the Belt and Road.